When the Germans wanted the American troops who were surrounded and fighting the battle of their lives to surrender, General McAuliffe had one word for them. The word was 'Nuts!' This was easily 'the most famous single word uttered by any American commander during World War 11,' according to Jerome Corsi. 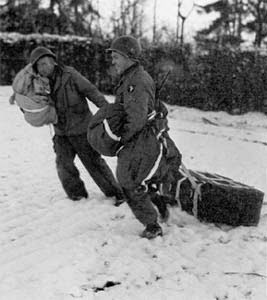 General McAuliffe summarized the way that most of the Americans who fought in the famous Battle of Bastogne felt even though they were fighting in dreadful weather, suffering from lack of provisions, arms and clothes, and needed reinforcements. They had also been surprised by the several forces that Hitler had amassed - this lack of knowledge was a massive intelligence failure. Hitler's famous Wehrmacht approached the little Belgian town of Bastogne from four directions, so the Americans had their backs to the wall. Corsi relates the story of this miracle battle in this well-researched and detailed book, using quotes from interviews and biographies to illustrate his main argument that they won primarily because of their great faith. I found the book a bit dry and heavy at times, but I don't usually read books about battles. However, it was full of interesting stories and anecdotes, such as the tales about the adventurous priest, how Patton's prayer assisted the weather, and mysterious angels. If you like reading about the history of the Second World War, this is highly recommended.